Ah, Valentine’s Day. Supermarkets are awash with red balloons, rose-coloured confetti, sappy greeting cards and, you know, heart-shaped pizza. Everyone seems to have a table booked somewhere and TV is full of the same old, cheesy storylines. If your inclination is to curl up with a box of chocs and a lovely romantic read this February 14th, you’re not alone. But which book should you go for? Here, in this special Valentine’s Day Battle of the Books, some of our favourite book bloggers join members of Team Novelicious to argue for, what they think, is the best loved up literature ever written. Do you agree? Feel free to join the conversation in the comments and let us know what YOU think the most romantic book of all time is. Named the Festival of Romantic Fiction’s Romance Blogger of the Year in 2013, Kirsty Maclennan of The Love of a Good Book knows a thing or two about love. Here, she explains her choice: “There's something incredibly beautiful about the idea of meeting someone and having such an intense connection that you can't get them out of your head. This is why I absolutely love It Started With A Kiss by Miranda Dickinson. When Romily meets a handsome stranger and shares a kiss with him, it sets off a year-long search for the man who ignited her passion and warmed her heart. There's something truly romantic to think, It Started With A Kiss! Laura blogs at Novel Kicks and thinks Ralph's Party by Lisa Jewell is one of the most romantic books of all time. She says: "My reason for loving this book is quite a personal one. Ralph's Party is about the residents of 31 Almanac Road. Ralph and Smith live in the basement flat and don't think they will find a suitable flatmate until Jem comes along. Smith and Jem quickly become an item. Ralph falls in love with her, but is too gentlemanly to do anything about it until it's almost too late. This book was my introduction to Lisa Jewell. I read it pretty much from cover to cover on a coach trip to visit my boyfriend (now my husband). We hadn't been together long, so this book will always remind me of the lovely day I spent with him and the excitement about what was to come in the future. The characters in the book were falling in love – as were my husband and I. Cheesy but true." Novelicious columnist Helen could relate to the romance in Freya North's Sally. She says: "Sally by Freya North is a romantic novel written just for me – I’m certain of it. I first read it when I too was a young career woman about (London) town. Sally’s circumstances were similar to mine when she met her future husband and experienced that heady and exciting, yet confusing, time while falling in love with The One. It felt like a romance that could happen to me. And, as it happened, it did. But that’s another story..."
Fiction Dreams blogger Suzy Turner says: "I'm a sucker for a romantic tale that transcends time and space – anything that's a little supernatural does it for me. So one of my all time favourite romance books has got to be PS, I Love You. I mean, the love that this couple has for each other is so intense, it makes the hairs on the back of my neck stand up. It's so beautifully written too. That Cecelia Ahern is one awesome author! 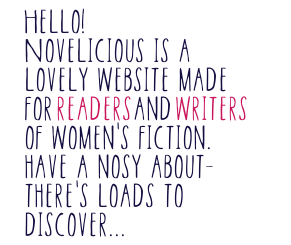 PS – The fact that the movie version has Gerard Butler certainly didn't sway me at all..."
Leah blogs at Chick Lit Reviews and News and reckons Something Borrowed is the most romantic book ever. “My favourite romantic book of all time has got to be Something Borrowed by Emily Giffin. It's my favourite book, ever, so it stands to reason that it must be my favourite romantic book, because I read chick lit for that very reason! For the romance. Sure, Dex and Rachel don't have it exactly easy – they're both cheating on Rachel's best friend Darcy for starters, but it's those types of relationships that you know are built to last, despite the auspicious beginnings. (And you know, Darcy deserved it.) I hate cheating in chick lit (and in real life), but this is the only story where I've ever felt it was deserved, and Dex and Rachel's relationship is simply beautiful;. They’re truly soul mates – together forever. Me, Bookshelf and I blogger, Melanie, loves Thirty Nothing by Lisa Jewell. “What do you get if you take a rough around the edges yet devilishly handsome man, his best friend who just happens to be a girl and in love with him, and his first ever girlfriend from school, who has just walked back into his life 12 years later? Why, a classic love triangle, of course! Laugh out loud funny, beautifully reminiscent and ever so romantic ... a brilliant reminder that sometimes you don't need to look any further than right in front of you." Finally, Novelicious writer Cressida raves about a little-known book by the author of Cold Comfort Farm. She says: "My mum urged me to read this relatively little known book. It's by Stella Gibbons of Cold Comfort Farm fame, and follows Viola, who is widowed at a young age and ends up living with her dead husband's family. Viola is miserable when she arrives, but she soon discovers that there's a handsome, eligible bachelor living in a manor house nearby, a young, ambitious chauffeur and a charity ball on the horizon. It is warm-hearted, hilarious and captivating, with two strong, unpredictable love stories, at least four heroines, smouldering heroes and shaded, mysterious Nightingale Wood at its centre. It made me cry with laughter and sob happy tears. Nightingale Wood is the most romantic book I have ever read. If you read it – and I think you should – I hope you fall in love with it as much as I did." So, what do you think, book nerds? Is your favourite here? Time for you to weigh in and tell us what YOU think the most romantic book of all time is.